CrackBerry Poll: How Many BlackBerry Messenger Groups do you belong to? What kind of groups are they? BlackBerry Messenger. BBM. It's one of those hooks that keeps sooo many of us loyal to BlackBerry. Once you're connected to friends, family, co-workers and colleagues via BBM it's hard to not be. Over the past few months we've really seen Research In Motion start pushing BlackBerry Messenger on commercials and in advertisements, including one of its newest and best features, BBM Groups. If you're reading this post on CrackBerry, I'm going to assume you know what BBM Groups are all about. If not, check out our BlackBerry 101 Lecture on BBM Groups. 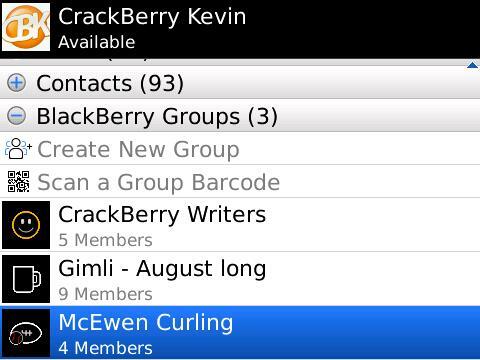 So the question I have today for CrackBerry Nation is how many BlackBerry Messenger Groups are you a member of? Cast your vote on the poll above and let us know! Following the vote, let us know in the comments what kind of BlackBerry Messenger Groups you're part of. Is it a social group for friends and family? A group for the people you work with? Maybe it's a group for the sports team you play on. BBM Groups are one of those BlackBerry things that have really impacted my life for the better! So if you're using Groups in a creative way, be sure to share your story with the community.